So when they come to me for help turning their copywriting into a sales machine, it’s not because they’re bad at what they do, or they have no idea how to run a business, or their content is bad. It’s because there are so many nuances that go into website conversions that it’s hard to get them all, especially when you’re so busy. Plus, some of it seems downright counterintuitive. I get it. You genuinely care about making a difference for your clients, but it just doesn’t translate into website sales. 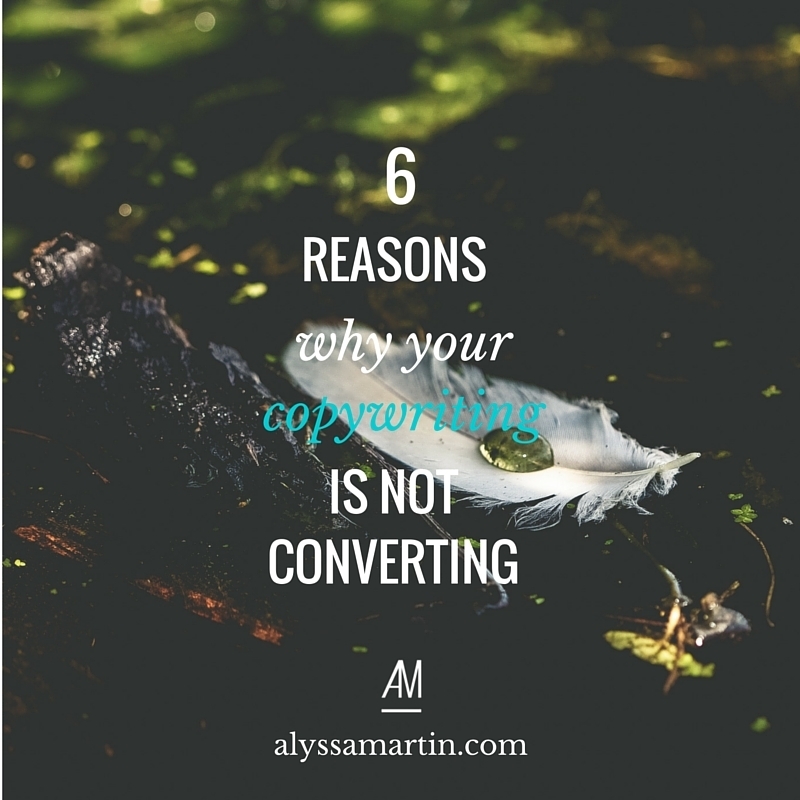 So let’s talk about the 6 reasons why your web copy isn’t converting visitors into clients. These are totally fixable, even if you feel like you have no idea what you’re doing when it comes to copywriting. I’ve said it before, but I’ll say it again: your website is NOT about you. Your website is about your dream client. And you can’t get that kind of result if you don’t know who you’re talking to. So before you start, take the time to think about who your dream client is. I know you feel like you’ve done that exercise a thousand times. But you need to do it again because your dream client is constantly growing & evolving, just like you are. Having an intimate understanding of your dream client lays unshakeable foundations for your marketing success. But maybe you do know lots about your dream client and are wondering when the results will show up? If that’s the case, there’s a good chance your web copy is too informative, too clinical, too distant. Your dream clients want to feel like you understand them – which means knowing how they’re feeling. Think about when you make a new friend & feel strangely connected to them really quickly. It’s often because you jump into the deep & meaningful conversations that create a bonding experience. I’ve written entire blog posts about the fact that your clients care more about themselves than they care about you. Your dream clients want to know how they will benefit from hiring you or buying your thing. The answer to that question might surprise you. They often don’t care about the things you might assume. It’s usually much deeper than you first think. For web designers, she doesn’t want a new website. She really wants to have a website that brings in more clients or reflects her real personality or… you tell me? It’s your job to find out what they really care about & focus on that in your web copy. This blog post will help you figure out the benefits that they really care about. Then, you need to explain that they don’t just get 5x coaching calls or 3x social media templates (or whatever you sell). Use your web copy to tell them what they’ll really get out of those features & focus on the benefits that they get from each of those features. People don’t know what they want. They freeze up when faced with too many choices. If we get too many options, we get paralysed by overwhelm. And instead of taking action, we do nothing. … then that’s way too many choices. And there’s a very high chance that they’ll take ZERO of those options, which means you won’t make any sales. If you narrow your call to action down to just one thing, it reduces the overwhelm, makes the next step look really easy & gets you far more responses. Basically, 1 call to action ® more sales. That startling fact makes your headlines even more important. They’re your chance to quickly grab your audience’s attention in 8 seconds or less before they click away. On average, 8 out of 10 people will read your headline, but only 2 out of 10 will read the rest… which makes headlines the most important thing you’ll write. Without a great headline, there’s a very, VERY high chance that the rest of your content won’t get read. And if that happens, there’s 100% chance that your services won’t sell. This blog post will give you 20 of the Greatest Headlines of All Time to help inspire you when you’re stuck on what to write for your next headline. Risk dominates the hiring decision, especially as your price goes up. You’ll know from personal experience that you put a lot more thought & consideration into spending $10,000 than you do when spending $100. You want more info & you need more persuading to part with that much money. So what does that mean for you as a service provider? It means that the higher you price your service, the more information you need on your sales page to convince people that it’s the right investment for them. All of those things combined help them see that you understand them & are a total professional that will deliver on everything you promise. STILL STUCK ON HOW TO WRITE PERSUASIVE SALES COPY THAT ATTRACTS MORE DREAMY CLIENTS? Check out the Sales Page Masterclass. This LIVE masterclass will give you a step-by-step, repeatable process to write a sales page that lets more of the BEST CLIENTS through your digital door. The Sales Page Masterclass is going to change your thinking about sales pages.